The predicted rise in oil and gas development, fishing, tourism, and mineral mining could alter the Region’s strategic importance as Arctic and non-Arctic nations make investments. Despite this gradual ice opening, the Region’s frequent harsh weather and sea conditions are significant limiting factors for Arctic Ocean operations. This update of the 2009 Navy Arctic Roadmap provides guidance necessary to prepare the Navy to respond effectively to future Arctic Region contingencies, delineates the Navy’s leadership role, and articulates the Navy’s support to achieve national priorities in the Region. Navy functions in the Arctic Region are no different from those in other maritime regions; however, the Arctic Region environment makes the execution of many of these functions much more challenging. Prepare for a wide range of challenges and contingencies. Promote partnerships within the United States Government and with international allies and partners. In the coming decades, the Arctic Ocean will be increasingly accessible and more broadly used by Arctic and non-Arctic nations seeking the Region’s abundant resources and trade routes. Due to the significant retreat of sea ice, previously unreachable areas have started to open for maritime use several weeks each year. Arctic nations make investments. Despite this gradual ice opening, the Region’s frequent harsh weather and sea conditions are significant limiting factors for Arctic Ocean operations. 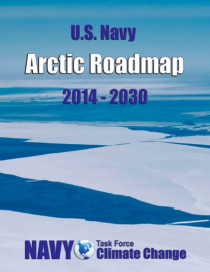 This Roadmap provides direction to the Navy for the near-term (present-2020), mid-term (2020- 2030), and far-term (beyond 2030), placing particular emphasis on near-term actions necessary to enhance Navy’s ability to operate in the Arctic Region in the future. In the near-term, there will be low demand for additional naval involvement in the Region. Current Navy capabilities are sufficient to meet near-term operational needs. Navy will refine doctrine, operating procedures, and tactics, techniques, and procedures to guide future potential operations in the Arctic Region. In the mid-term, the Navy will provide support to the Combatant Commanders, United States Coast Guard, and other United States Government agencies. In the far-term, increased periods of ice-free conditions could require the Navy to expand this support on a more routine basis. Throughout these timeframes, the Navy will continue to develop and enhance cooperative relationships across the Department of Defense, United States Government agencies, industry, and international allies and partners.